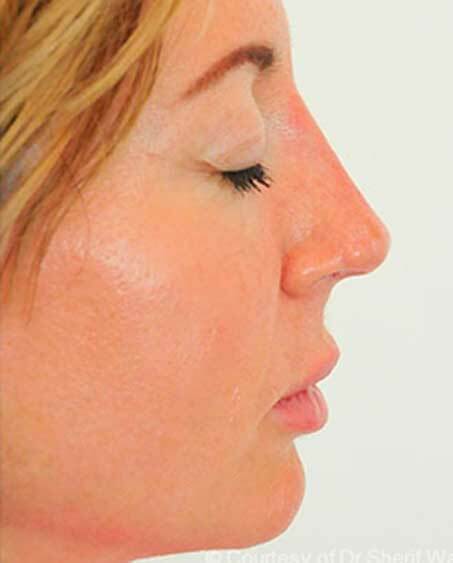 For patients who desire a change in the shape of their nose but prefer an alternative to invasive surgery, Dr. Milgrim offers a non-surgical nose job from the comfort of his New Jersey office. Board-Certified facial plastic surgeon and rhinoplasty expert Dr. Milgrim re-sculpts bumps, twists, tips, and other asymmetrical mishaps until your nose’s shape is smoother. Though injections cannot reduce the size of your nose, they are effective for patients who desire a more symmetrical appearance. Dr. Milgrim employs injectables such as Radiesse, Voluma, and Bellafill to create temporary, restructured results without the downtime which typically accompanies a rhinoplasty procedure. Dr. Milgrim’s goal is to provide you with desired results while creating harmony between your nose with the rest of your face. This is a quick fix – after a short visit to our NJ office, you can get back to your normal routine with an updated appearance. Dr. Milgrim really enjoys performing non-surgical nose job because he can visibly alter the appearance of the nose quickly and the patient takes part in the process. This treatment can correct many nasal concerns without the need for surgery. A non-surgical nose job is also a great way to see how you might look with an altered nose before committing to surgery and permanent changes. That means no downtime, no risk of infection, and no long-term commitment if you don’t like your new nose! Before: Once you’ve met with Dr. Milgrim during your initial consultation, a series of photographs are taken and manipulated to showcase possible results. The doctor will explain the procedure and discuss your preferred filler. Dr. Milgrim advises patients to avoid any alcohol and the use of blood thinners such as aspirin prior to treatment to avoid excess bleeding. 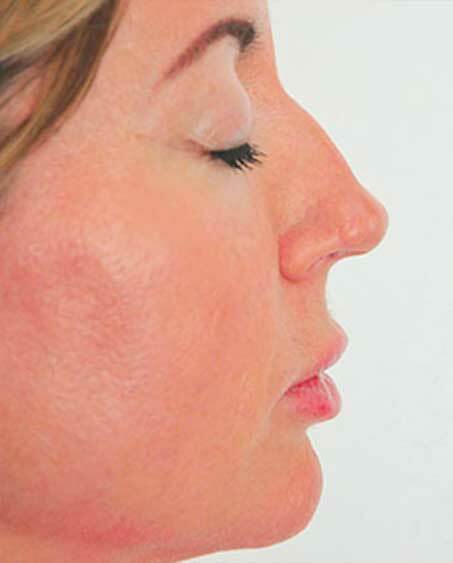 Before your rhinoplasty, an assistant will cleanse and apply a numbing agent to the patient’s face. We will apply ice packs to your nose prior to treatment to make sure it’s as painless as possible. During: A non-surgical nose job in New Jersey is a same-day procedure performed right in our office. Our offices administer a topical anesthetic prior to your procedure to prevent pain. Dr. Milgrim practices extreme care while injecting fillers into your nose. The doctor administers a series of dermal fillers into the targeted areas of your nose, leaving patients with a straighter nose. This quick procedure provides corrective treatment without scarring, excessive pain or the added expenses of traditional surgery. After: We provide Arnica to soothe your nose after treatment. Following surgery, your nose may be tender, swollen and red. This discomfort subsides in about two weeks, should the pain lasts longer please contact the office of Milgrim Plastic Surgery. Non-surgical nose jobs should be maintained once every nine months, please visit our office for a touch-up. Of course, there are limitations to what can be achieved with a non-surgical nose job, but it is a great solution for many, many people. If you’ve been considering rhinoplasty, but aren’t quite ready to take the plunge, Dr. Milgrim will review your case and see if a non-surgical nose job could meet your goals. He can also advise you on a surgical nose surgery and explain the difference in results. Your nose is a sensitive, complex and highly visible part of your face that requires the trusted hand of a Rhinoplasty expert. Avoid going to a nurse injector who can create scar tissue that would be later hard to remove. Dr. Milgrim knows how to navigate the tender cartilage and planes between nasal tissue. He will be able to tell you what can be achieved without surgery and make sure that your expectations are realistic. Do you live in New Jersey and want an immediate fix to improve the appearance of your nose? Email us or call 201.357.4702 today and schedule a complimentary consultation. Dr. Milgrim often sees non-surgical nose job patients who come to our Bergen County office from nearby communities, including Teaneck, Englewood and Fort Lee.